Every Briskly Deal is valid from the time its viewed until the expiration time indicated on the offer, unless all available quantities are sold out. The only way to insure the offer is available during the time window of the offer is to select to Grab Deal. If the offer is On Hold, the time to redeem the offer (Timer) will be activated and display the time remaining to reach the business offer location. The Timer will be set based on the distance to the business offer location and the location in which the offer was On Hold. The Redeem option will be available upon arrival of the business offer location. Redeeming the offer must be completed before the time expiration. The offer will no longer be valid after the offer timer expires. Only one Briskly Deal per customer prior to redeeming the offer. Each offer has a specified quantity limit per customer. Customers can On Hold at maximum the quantity limit indicated in the offer. 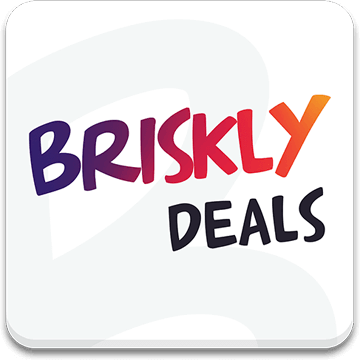 This App, Briskly and Briskly Biz are a platform for businesses to flash offers to customers, and for customers to view and possibly act on these offers. All content of the offers is the sole responsibility of the businesses which posted them. Briskly assumes no liability for any business or customer contents. In no event shall Briskly be liable for any direct, indirect, punitive, incidental, special consequential damages, to property or life, whatsoever arising out of or connected with the use or misuse of the App. All of the information provided on this website is provided "AS-IS" and with NO WARRANTIES. No express or implied warranties of any type, including for example implied warranties of merchantability or fitness for a particular purpose, are made with respect to the information, or any use of the information, on this site. Briskly makes no representations and extends no warranties of any type as to the accuracy or completeness of any information or content on this App. Briskly specifically DISCLAIMS LIABILITY FOR INCIDENTAL OR CONSEQUENTIAL DAMAGES and assumes no responsibility or liability for any loss or damage suffered by any person as a result of the use or misuse of any of the information or content on this App. Briskly assumes or undertakes NO LIABILITY for any loss or damage suffered as a result of the use, misuse or reliance on the information and content on this App. Briskly’s maximum liability is limited to the actual fee charged to the business for the specific item or services redeemed.